After sailing The Whitsundays, par taking in our first Beach Clean on Five Rocks Beach and letting our hair down in Byron Bay, we had already been blown away on several occasions by the beauty that Australia has to offer. And, in the case, of the beach clean, the utter destruction human activity is having on this beauty. We continued to explore Australia Contiki Style, stopping off at a Cattle Station in the outback (UNREAL), Spot X Surf camp in Coffs Harbour & last but not least, Sydney. Initially, when we were told we were staying on a Cattle farm in the outback for a night, admittedly, we all looked at each other and raised our eyebrows slightly. Smelly animals, bud ridden beds, no phone signal and the potential prospect of… having to talk to each other. Haha, i’m just kidding… well kind of. Ever ready for an adventure, we all arrived, prepared to embrace what ever it was we were about to be faced with. To our surprise – we couldn’t have been more wrong. This state of the art, spacious and very much impeccable barn was a DREAM. We all dumped our bags in our cute little bunk bed rooms that circled the outside of the barn before heading inside for a cup of tea and some fresh warm bread drizzled with golden syrup. The rest of the afternoon had us explore the ground of the farm on the tractor, get whizzed up into the air by the on site open helicopter before freshening up before a night of ciders and karaoke in the barn. Oh and inbetween all of that I fell very much in love with their farm dog who has a wonderful name… Molly. A night without access to the outside world was a much needed reminder that, life DID exist before technology and there is nothing more beautiful than uninterrupted human interaction. Located somewhere north of Coffs Harbour and South of Byron Bay, this little gem of a place took us, once again, by surprise. We were told that the accommodation was really basic and so to not expect much. Yes, there were many a bug to go around and no there was no air conditioning. But the low expectation had us all gob smacked when we saw the location. Only gone and got ourselves a self catered waterfront cabin. A mere 10 steps from the beach, a balcony over looking the ocean and a kitchen with a sea view – I fell immediately in LOVE. We spent the rest of the day surfing, lounging and joking around before joining the rest of the camp for a communal dinner of homemade Chicken Curry. Whether you’re staying in a teepee, a dorm room or waterfront cabin here at Spot X, be it for 4 days, 4 weeks or 4 months – I instantly got the vibe that everyone becomes one big family. Backpackers, travellers, surfers and alike all immerse themselves here in a authentic surf lifestyle, before continuing there adventures up and down the coast. Whether you’d like to enjoy the surf, learn to surf or become a surf instructor, Spot X caters for all. As we all huddled around the campfire and listened to local musical talent – we all dreamed of staying longer. Thank you for having us Spot X. The last stop for us on this incredible tour of Australia with Contiki and Surfrider Foundation was Sydney. Here we checked into the Travelodge located in a perfectly central spot next to Hyde Park. Our itinerary was packed as usual and began with a twilight climb of the Sydney Harbour Bridge. Last time I came to Sydney was at the end of my 7 weeks backpacking trip last year. I didn’t have the budget to do the Bridge Climb despite being desperate to, so I was over the moon that not only we got to do it this time… but we got to do it at twilight – the best time. Our next couple of days included a trip to Avalon, one of the Northern beaches in Sydney, where we met Surfrider and participated in a reuseable bag workshop. From physical donations made to the charity, the team at Surfrider make thousands of bags by hand for distribution across Australia. Their work is breaking boundaries and they even have local supermarkets offering the FREE use of these bags to avoid unnecessary plastic bag use. We, too, got hands on with making our own reusable bags before heading out into the annual Avalon market bonanza and putting them to good use. Our last day had us visit the world famous location of Bondi Beach. Filled with award winning restaurants, hot surfers and beach side hang outs this iconic stretch of beach can’t be missed on your trip to Sydney. 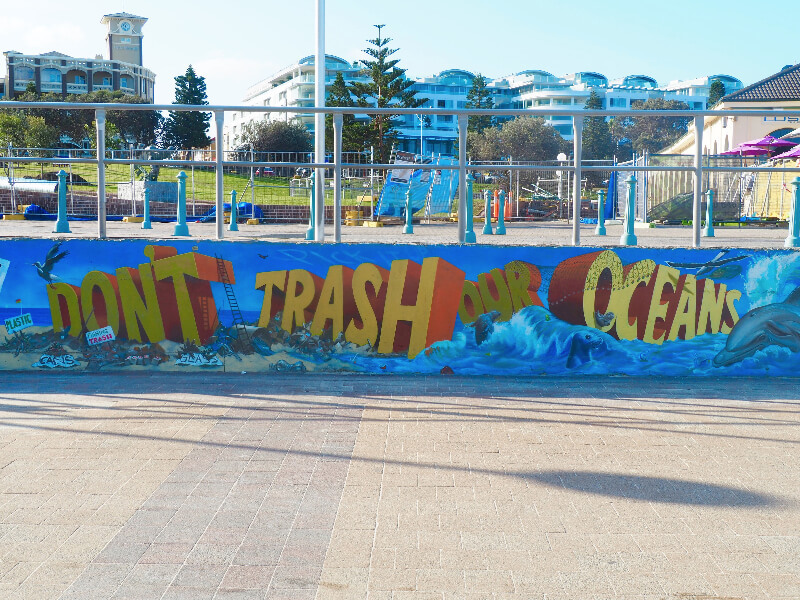 When we were told we were to participate in our final beach clean here at Bondi – I was a little confused. I’ve been to Bondi before and it never struck me as dirty, but i knew i was about to be proven wrong. Every morning the beach is raked of litter to allow thousands of visitors each day to enjoy it. But even so, the raking only just scratches the surface. As we rummaged around and begun to dig beneath the first layer of sand – what we found was heart breaking. In just under an hour we found SO much rubbish, including 1476 cigarette butts, which, for a non smoking beach – isn’t cool. The truth is, we all need to take responsibility for our part in this. Laziness just isn’t good enough. If you, like me, LOVE exploring the beauty of this earth we need to act sustainably, otherwise generations to come will have nothing to enjoy. Plastic is a massive problem. And the problem is getting bigger. Plastic is destroying the ocean, the marine life, the beaches, and eventually… will destroy us. It’s toxic and it’s making its way into our food chain. We need to use plastic responsibly and avoid its use wherever possible. We need to make sure we don’t litter and recycle wherever possible. We need to act and not ignore. Thank you Contiki and Surfrider for an unbelievable and unforgettable experience. I know it has changed my attitude to plastic use and consumption and I hope you guys can think twice now too. Have you guys been to Australia?! What were your favourite spots? !